Chief Minister Smt. Vasundhara Raje has said that during the span of three years the State Government has brought a number of policy reforms and we are working tirelessly to transform the state and bring it on the forefront. She asked collectors to play the role of team leader in the task of effective implementation of our schemes and programmes to bring smile on the face of people. She directed the collectors to ensure that people of state get proper benefit of the flagship schemes and innovations. Smt. 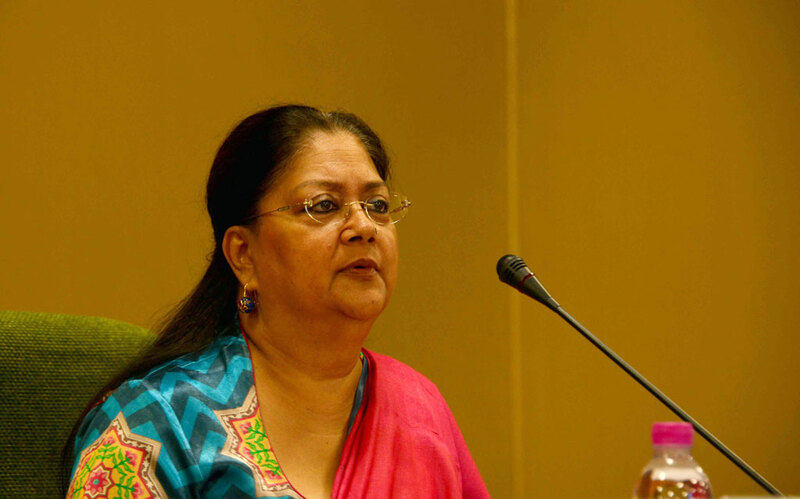 Raje was addressing the inaugural session of the Collector-SP Conference at the Convention Hall of CMO on Thursday. She asked administrative officers to increase communication and simplify the day-to-day government-citizen interface. The Chief Minister said we set for ourselves a vision that encompasses infrastructure and social development. Roads, electricity, water, health, education and employment are main pillars of good governance, she said. She said our government is concentrating on all those schemes and initiatives already put in place and our collectors have important role in review of the progress reflecting our vision of development. She asked collectors to drill down the nature of grievances in each category, classify them and then evolve a suitable strategy for resolving such grievances. Smt. Raje said behaviour and style of functioning reflects the image of an administrative officer. She asked collectors to work with more promptness and remain vigilant. She asked collectors to put best efforts for the success of Jan Kalyan Shivirs and asked them to ensure that all the responsible officers reach the camps on time. She suggested that for proper monitoring of flagship schemes and projects and the implementation of the budget announcements effective monitoring should be done during review meetings held every week. She asked collectors to undertake tours of the work sites with departmental officers. The Chief Minister directed that all collectors should make their districts Open Defecation Free by March 2018. She said collectors need to make special efforts and draw new strategies to meet this deadline. In the beginning of the Conference Chief Secretary Shri O. P. Meena welcomed the Chief Minister and divulged details about the agenda of the conference. After the inaugural session ACS, Social Justice and Empowerment Shri Ashok Jain gave presentation on Social Security Schemes, Scholarship and Palanhaar Scheme. ACS, PWD Shri D. B. Gupta gave presentation on Gramin Gaurav Path, Missing Link and the status of roads in the state. Principal Secretary Agriculture Smt. Neel Kamal Darbari gave presentation on preparedness of Rabi season and Pradhan Mantri Fasal Bima Yojana. Principal Secretary PHED Shri J. C. Mohanty gave presentation on the status of drinking water projects. Principal Secretary Medical & Health Smt. Veenu Gupta gave presentation on Bhamashah Swasthya Bima Yojana, Adarsh PHC and Initiatives taken to bring down MMR and IMR. Principal Secretaries and Secretaries of other departments also gave presentation. Members of the Council of Ministers, Parliamentary Secretaries, Divisional Commissioners and other officers were present during the conference.